It looks incredible. There’s just something about the way the glossy, pitch-black finish makes the display blend seamlessly into the case, giving the Space Black a very sleek, refined look. And because it’s polished to be very shiny, it also catches light and reflections well enough. Differently than the regular Stainless Steel, but well enough to make it noticeable, as if a black monolith against your skin-coloured wrist wasn’t already noticeable enough. Paired with the right bands, the Space Black can look very slick indeed. 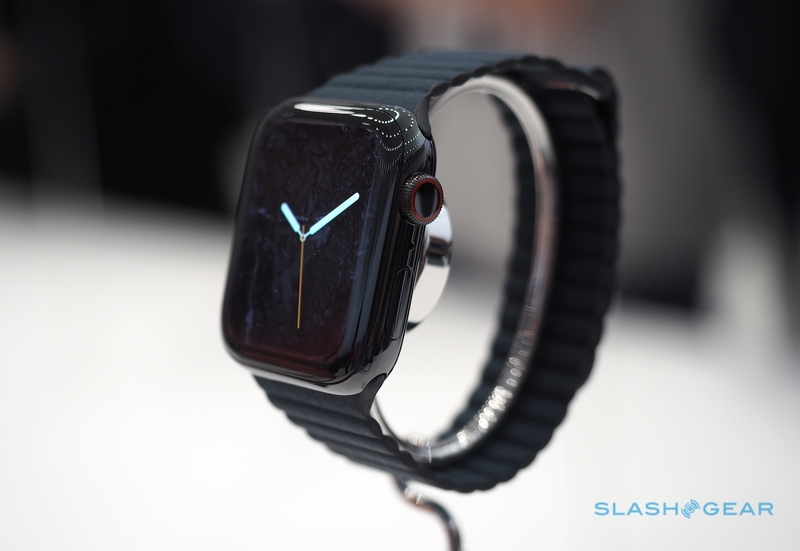 What you see above is SlashGear’s photo of the Space Black Series 4 from the hands-on event where right after the Series 4 was announced, paired with what looks like a black Leather Loop, and it looks amazing. The way the shiny display catches the light, as well as the case, with the band completing the very refined look, makes for an incredibly attractive package. But as nice as the Space Black can look, it’s not without its own disadvantages. First, band compatibility. There are plenty of people who say there are less band choices with the Space Black, usually for one of two reasons. 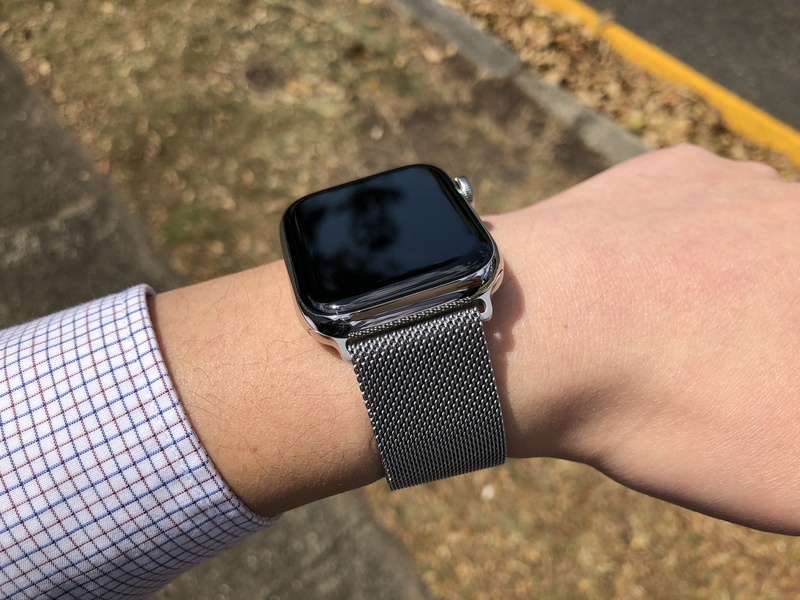 Most of Apple’s own watch bands (and those that you can get from third parties) have Stainless Steel lugs (the part that connects from the band to the watch body) that don’t match the deep, piano-like glossy black of the Space Black. This is especially evident with most of Apple’s leather bands, with Leather Loops being the obvious exception. While you can get third-party bands that have matching black lugs, they’re not exactly common, and the last thing you want is to ruin the all-black look with a lug that stands out. And while I would personally consider darker bands a better match with the Space Black for mostly the same colour-matching reason, there are those that like the contrast between the dark watch body with lighter bands and/or mis-matched watch body and lugs — although if it’s contrast you want, I’ll point out that the regular Stainless Steel is able to offer that in spades. Secondly, the Space Black has a very “technical” look to it, and the fact that it’s all black, all the time, means some might even call it intimidating, or even oppressing, although that might be a bit of a stretch. But its durability is second to none, with the Diamond Like Carbon-coating being near-impervious to regular scratches and scuffs that would definitely show up on the regular Stainless Steel. It’s that same durability that means if you do somehow get a scratch or chip in the Space Black, you can’t repair it yourself. You can’t just polish the Space Black like you can the regular Stainless Steel, as the DLC doesn’t work that way, and you’ll need to get the entire watch body replaced if you want a pristine condition watch again. It’s not something I’m particularly concerned about, given that AppleCare+ is a thing, but something to bear in mind all the same. And while the Space Black looks incredibly sleek, I’m not sure how it pairs with different outfits. I’m no fashion guru, but I feel as though there are plenty more traditional watches that are Stainless Steel than there are black/darker-coloured ones. As sleek as the Space Black looks on your wrist, some might say that it stands out too much1, both for casual jeans and a t-shirt, or a more formal shirt and pants scenario. You can start to understand my indecision. The regular Stainless Steel looks classier. But the Space Black looks sleeker. The Space Black doesn’t scratch easily. But the Stainless Steel wears its scratches with pride. The Stainless Steel looks better with more bands. But the Space Black can pull off a single-colour combo that isn’t possible with the Stainless Steel, and besides, how many bands are you going to realistically wear anyway2? I thought I had made up my mind. I thought I wanted the regular Stainless Steel — the classical, timeless option. Then I saw how amazing the Space Black looked, and what was once dependable and reliable now looked bland and boring. There’s a part of me that still knows the regular Stainless Steel is the safer option. But there’s a part of me that wants something different, too, given that I’ve already had a regular Stainless Steel for the better part of three years. The reason I didn’t have this problem the first time around was because the original Space Black Stainless Steel Series 0 was priced outside of my price range. Not only did it carry a $150+ price premium over the regular Stainless Steel, at the time it was only available paired with the the Space Black Link Bracelet, which continues to be Apple’s most expensive band to date if we’re not counting the luxuriously-priced Hermés leather bands, which itself continues to carry a similar price premium over its brushed Stainless Steel counterpart. Now that both Stainless Steel and Space Black are available for the same price, you can take your pick. What about the Stainless Steel Gold, I hear you ask? Well, what about it? It’s nice — some say the nicest shade of gold Apple has come out with thus far — and while it would definitely satisfy my different criteria, it’s probably a little too different. Maybe if I was a few years older, but I’m not as attracted to the gold as I am the regular Stainless Steel or Space Black. I’m almost convinced that some Series 4 redesign magic is at play here, either because the screen takes up that much more of the face of the watch than it did before, or because Apple has somehow made the watch body itself somehow less visible when you’re looking at the watch dead-on. Wearing the Series 4 on my wrist, it was sometimes hard to tell that it had a Stainless Steel finish (or perhaps I just didn’t notice because my eyes saw what they had seen for the past few years). But looking at my old, slow friend Series 0, the Stainless Steel sides of the watch body are pronounced and easily noticeable in a way that I don’t remember the Series 4 being3. It’s entirely possible that this effect is contributing to my confusion over what finish I want — if I’m less likely to notice the finish, does that mean it matters less? Maybe, maybe not. Chances are I’ll be happy with either. But if that was the case, I might as well have kept the regular Stainless Steel. Now that I’ve returned it, I get a few more weeks to decide. Or more, depending on how fast Apple re-stocks, and how indecisive I am4.